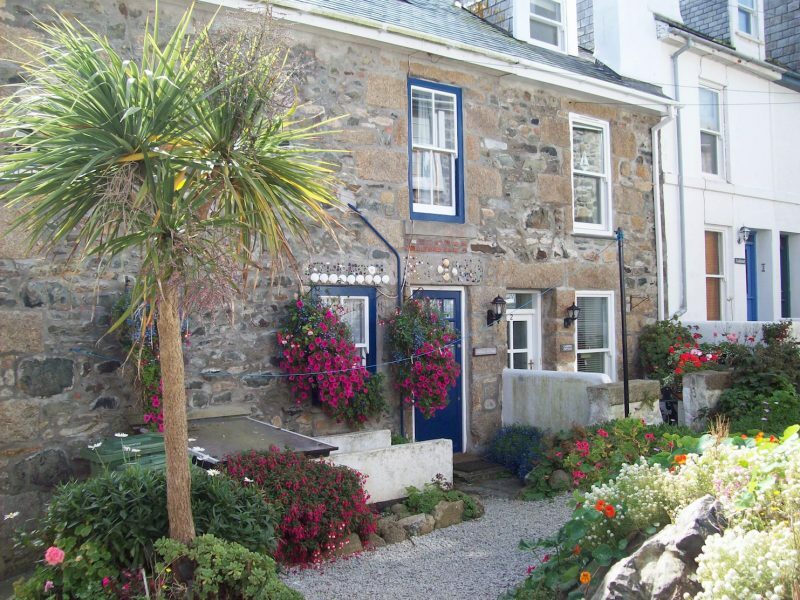 St Ives in Cornwall. Behold the scene that greeted me one autumn morning as I trekked from a station with a sea view. I’d just jumped off an overnight train from London after a bum-numbing all-night journey. It was a warm September morning and the town was less full after the busy summer season. Making it a little cheaper to stay and less crowded. 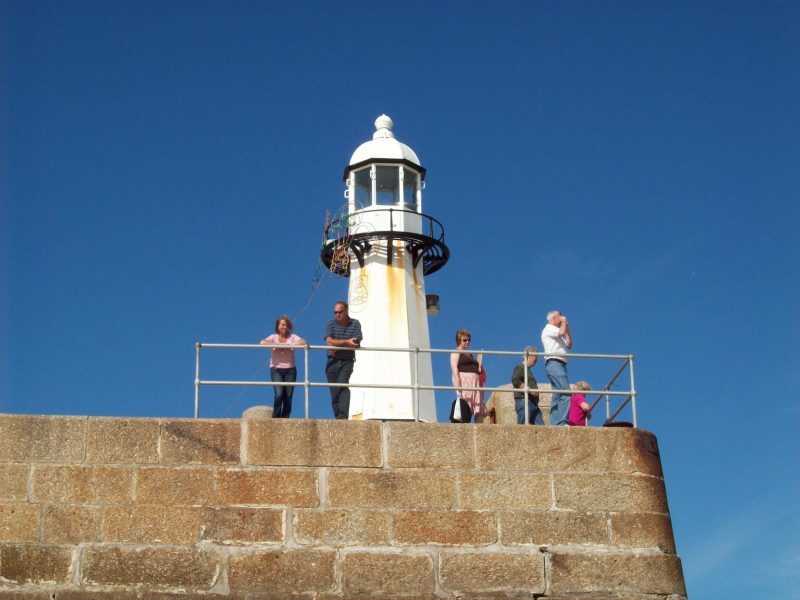 When I visited St Ives the credit crunch was in full-swing, so I decided to have a staycation. Additionally, it seemed like a good opportunity to get to know home turf after eighteen months in Japan. So feast your eyes on a seaside break from yesteryear. Immediately I fell in love with the fresh air, the sound of the sea and the amazing light. The very factors that had drawn artists to its confines in the early twentieth century. 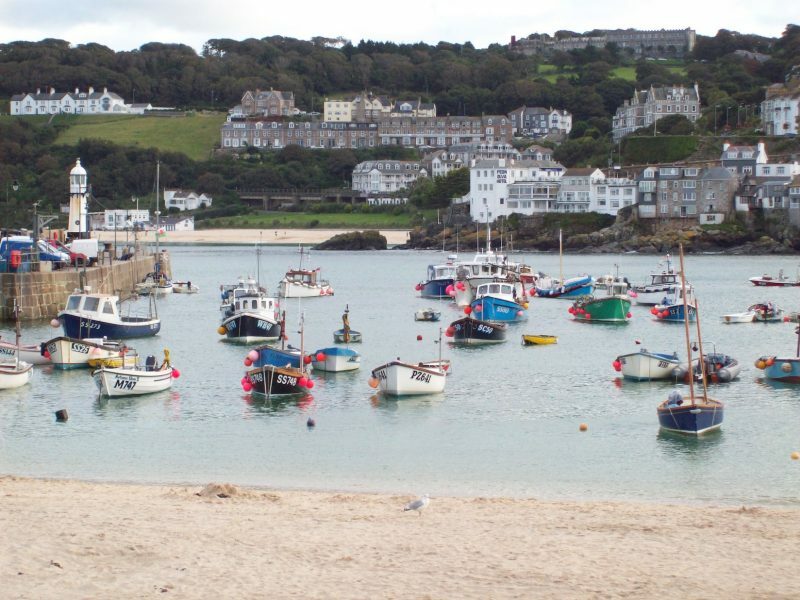 St Ives is on a small peninsula and more or less surrounded by dazzling blue water, meaning it’s perfect for painters. Apart from in the winter when it’s probably a dour grey. But I love grey days as well from time to time, having grown up in a seaside town that was prone to them as well as bright blue ones. It’s the boiling hot weather I can’t handle! I stayed at the Queen’s Hotel on the High Street which I found pleasant and friendly with an ensuite room with a view of the town. A little lively late at night, but nothing that kept me awake. Plus the city girl in me is comforted by the presence of people. Each morning I made my way to the seafront to Onshore to enjoy scrambled eggs on wholemeal toast and two strong coffees. Lunch was a vegan pasty on the beach accompanied by my sketchbook, while teatime was one of the many cafes in town. My favourite was the veggie burger guzzled on the seafront, watching the day sink into the sea. Just in case you think eating was all I did, there was art too. The Tate St. Ives, the Barbara Hepworth Museum and a life drawing class at the St Ives School of Painting took up some of my time. What’s more a couple of day trips took me out of town – I was the youngest passenger on the bus! 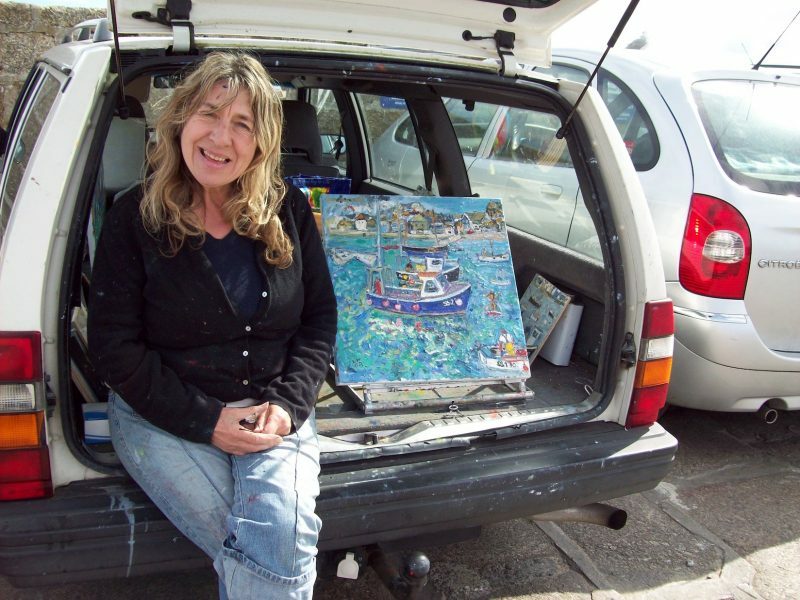 This lovely artist lady was selling her work on the harbour. I met her on a wee stroll around town on my first day in town, though sadly mislaid her details. 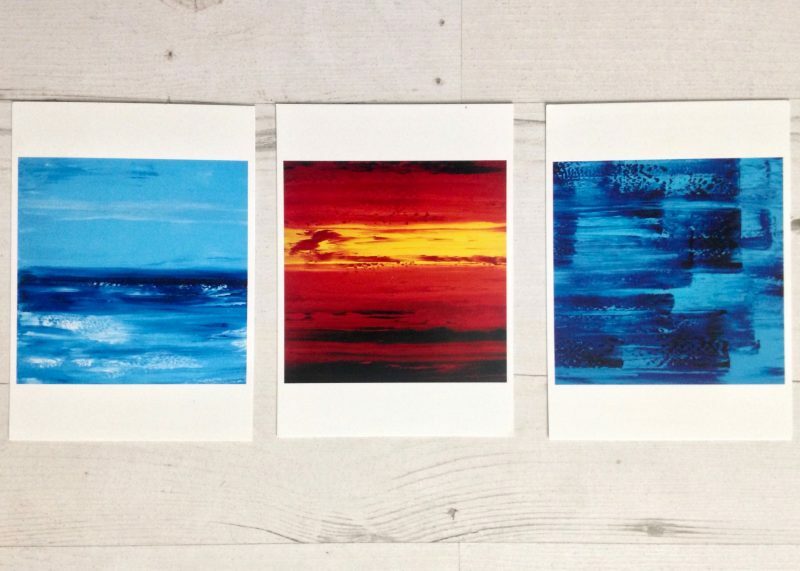 I ambled around the backstreets, discovering a gallery of bright and beautiful abstracts by local artist Alexandra Dickens (see postcards below). Luckily she’s still in town, so I can see her new work next visit. 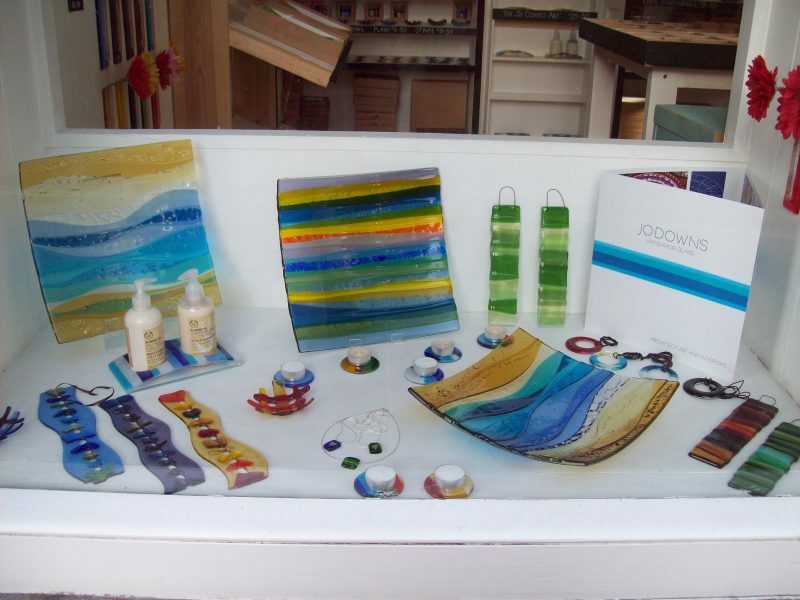 There was vibrant fused glass work by Cornwall artist Jo Downs whose shop was near my hotel (see photos below) and still is. In an idyllic setting brimming with inspiration, it didn’t take me long to want to drop anchor here myself. As I mentioned, the town is full of galleries, art studios and artists. Not to mention copious cafes and scenic walks. How could I go wrong? Wouldn’t it be worth finding a way to have this kind of life and make it pay, albeit modestly? However, no sooner had I decided I realised it wouldn’t be the easiest of plans. 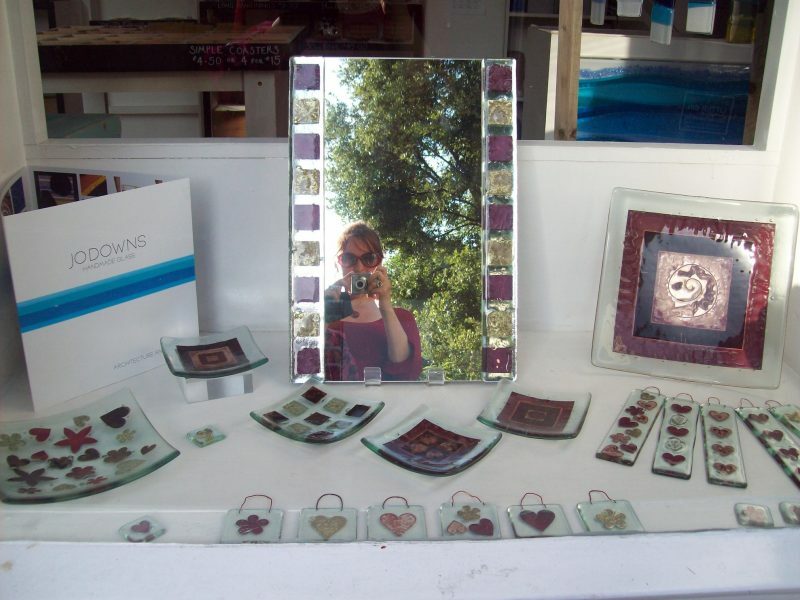 Artist-wise, the market is flooded and there’s precious little in the way of other work. Plus it’s tough for locals growing up there, many of whom find it hard to stay here. In the meantime then, I’ll visit and give the local economy a boost. Albeit a very modest one. 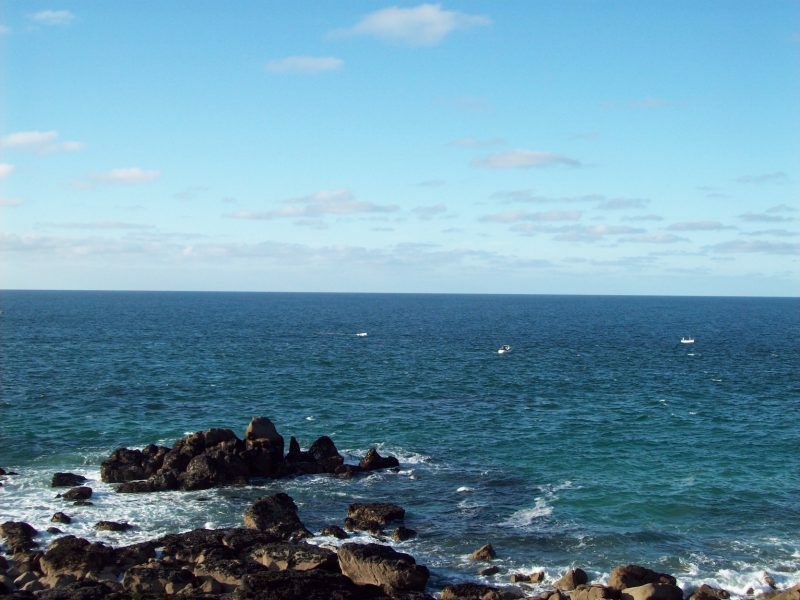 Visiting this coastal gem will prove more of a challenge now that I’m no longer in London. While I lived in the capital it was easy, since I took the overnight sleeper from Paddington. I forgot to book a berth and the train stopped for an hour at Exeter, so it wasn’t the comfiest of nights! Maybe you could jump on the first train and arrive early afternoon. But then you wouldn’t enjoy the benefit of the small town sparkling in the soft, morning sunshine. It’s all too easy to get used to living in a big city and all the convenience it offers. 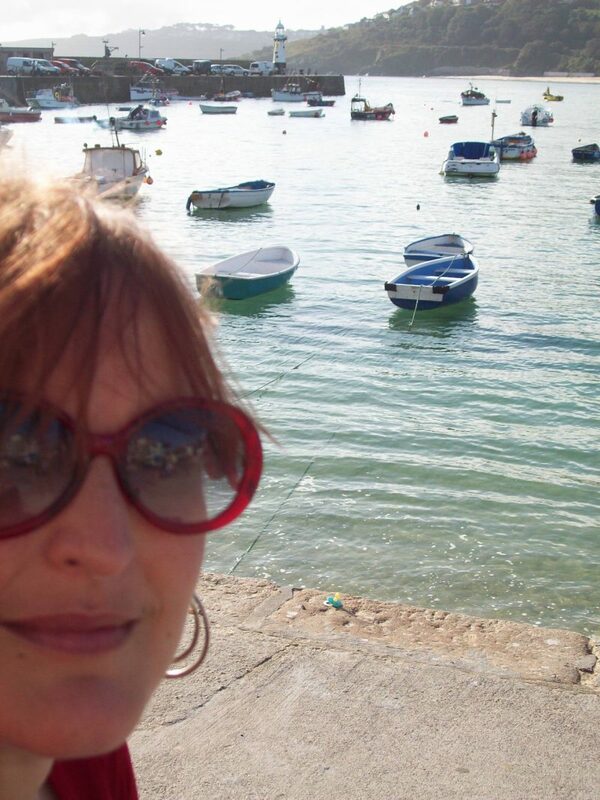 One day perhaps I’d like to wish city life adieu and find myself somewhere like St Ives. And looking a these pictures, could anyone blame me? 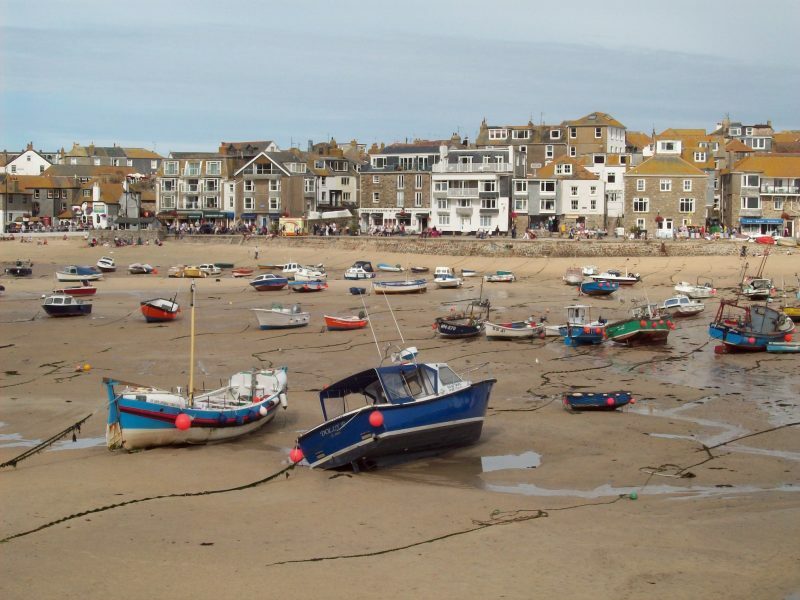 Have you visited St Ives recently? What should I see next time I go? Let me know in the comment section. "New Abstract Art: Autumn Equinox"
"Oban: An autumn road trip"